A few months ago I put up a post on the subject of 3D printing couple of photos, that post can be found HERE. Well I’ve now finished painting it and thought I’d put up another couple of pictures a long with a picture of the original computer model that that was used to create the file. This is of the sketchup file. As you can see fairly simple. And here is the finished work, painted and inked. You might notice that there are details on the side pods that aren’t present in the model, this is detailing added using Milliput to make more obvious that these are engines. Bravely the friend that produced this has agreed to have a go at another design – Dauntless from the first book of the Nameless War, so we’ll see what comes of that. Finally to round things off we have a picture from the model I prepared for the Ships of the Fleet Book Two. I couldn’t use this model because it is far too complex – under the hull there’s an internal layout – and unless prepared with printing in mind you end up with gaps that basically cause the printing program to have a hissy fit. So there we have it, interesting and kinda amazing what can be done. Oh and finally if anyone is wondering about scale it works out at about 1/666; no I did not do that on purpose. In the decades leading up to First Contact and the Contact War the concept of the spacefighter was one that had seen repeated use in the popular media. Such fictional craft allowed for the narrative to focus on a single (usually young and attractive) character who could drive the story. However in reality the idea of a manned spacefighter was technologically even more impractical than that of a starship. It was only with the arrival of the first Aèllr ship that serious work began to turn science fiction into science fact. The landing of the alien ship in the West of Ireland proved two things, that humanity was not alone in the universe and that Earth was utterly exposed. While reverse engineering of the Aèllr ship and crash development would result in first generation of human starships in less than a decade1* it was clear that Earth faced a window of vulnerability. While unmanned either satellites or drones initially appeared to be the logical choice, on closer examination such platforms had their own problems. To begin with they would have to designed and built from the ground up. Weapons platforms were rejected because the missiles systems that might have the performance to catch powered spacecraft were unsuitable for spending months in orbit without maintenance. This reduced the options to drones or manned fighters. While a drone would not suffer the mass and volume penalties of a human pilot and their attendant life support, it would have limitations of its own. Light speed communications even over the modest distances between a control centre and high orbit would introduce lags. The further a drone was required to operate from Earth the more severe these lags would become, ruling out direct control. The only alternative would be allowing a drone significant autonomy, including weapons release authority. This was felt to be an unacceptable risk, quite simply a human had to be kept in the decision making loop. With the private sector developments in sub and low orbital flights for so called space tourism, as well as the American experimental X series, a manned space fighter was judged to be just about possible. Raced through development and construction, Earth’s first spacefighter, the Phoenix, was available in numbers when the Aèllr’s Expeditionary Force arrived in the solar system. With the first of the Defender Class cruisers still incomplete, it fell to the fighters to be Earth’s only line of defence. The events of the First Battle of Earth scarcely need repeating, but while the fighters had succeeded in defending the planet, initially it was not believed spacefighters had any deep space role. The Bernards Star campaign forced a re-think; while the Aèllr deployed only a handful of fighters, these caused significant difficulties for the Defender Class cruisers and all but the most dogmatic big gun advocates had to admit that the fleet needed fighters. During the First Battle of Earth the Phoenix fighters had enjoyed huge numerical advantage over their Aèllr opposite numbers, despite this the human squadrons had suffered a minimum of fifty percent losses. With the Phoenix so vastly outclassed, there were serious questions whether a carrier with a limited number of fighter represented the best use of available construction assets. In some quarters it was felt that rather than build carriers, the fleet would be better to field a point defence cruiser, along the lines of the much later Lunar Class Flak cruisers. This idea did have some attraction but would have required a high performance vessel able to react quickly to tactical developments, therefore failed to find much traction for largely production related reasons. All available torus fusion reactors and plasma cannons were already earmarked for the cruiser program, carriers could accept the performance penalties of the heavier less powerful laser focus reactors. In essence the construction of the carriers did not come at the expense of additional cruisers. The final suggestion mounting a pair of hangars on each cruiser in an arrangement referred to as a ‘battlestar’ was never seriously considered. Hangars would almost certainly be shredded by gunfire and if hit before the fighter could be launched, the detonation of its fuel and munitions could present a significant risk to the mother ship. By the time design work began on the Glorious class work on the Commander class cruisers was already well advanced and it was felt that there was little advantage to be had from reinventing the wheel. As such the class would use a modified version of the Commander’s spaceframe. The armament was reduced to purely the point defence guns, while forward the centrifuge was extended to provide accommodation for a larger crew. The decision was made early on to house each fighter in it own hangar which would be slung from the flanks of the hull. As well allowing for the use of the spaceframe largely as was, this system avoided weakening the hull structure with large voids and outer hatches. From the tactical standpoint the carrier’s entire compliment could be launched virtually simultaneously and offered a high degree of redundancy in the event of mechanical failure or damage. In the longer term in the event that the type of craft carried altered it would be a relatively simple matter to build and fit new hangar modules. This decision was to prove one of the better features of the design and would be followed by later Battle Fleet fighter carrier designs. A more questionable decision was the one to reduce the power plant to a single laser focus reactor. Since the ship would not be carrying any plasma cannons, this power plant was equal to the task of powering propulsion and the space freed allowed for increased stores but left no redundancy in power generation. This potential vulnerability was accepted because it was expected that the carriers would be shielded from direct fire by the main gun line and the additional stores meant that despite their larger crew compliment, their endurance would match that of the cruisers. One of the most serious limitations of the new carrier were the craft it was due to carry. When ordered the expectation was that the ship would carry at least eighteen of the newly developed Valiant Drones. With Earth now at war many of the problems that had previously rule out drones were no longer an issue. However the specification for Valiants was ambitious and the delivery date began to slip. As a stopgap it was decided to equip the carriers with the Phoenix II. While little more than a stripped down Phoenix I it did offered some improved performance but was still out classed by its likely opponents. Completed shortly after the conclusion of the Bernards Star campaign, Glorious’s career was would limited to within Earth’s solar system. Glorious was in the process of being refitted with hangars able to accept the Valiant Drones when the Aèllr advance fleet arrived but when enemy forward base was detected around Pluto, the carrier and her complement of four Valiants and eight Phoenixs, was assigned to the attack. While the carrier herself received only minor damage during the battle, her entire fighter group was wiped out while attempting to cover the retreat. Designated Battle Fleet Number One squadron it was never reformed and as a mark of respect remains to this day officially listed as On Active Service. The aftermath of the New York attack and the abandonment of the Valiant program left Glorious bereft of any fighters. When the Aèllr began what was expected to be their final assault, Glorious was forced to take a place in the main gun line as little more than a target. However the June Miracle saw the withdrawal of the Aèllr fleet and Glorious, along with her newly complete sister ship, was hurriedly adapted to accept the Vampire fighter. The second human spacefigher, the Vampire had been developed as a reserve in case the Valiant program was delayed further. With the failure of the Valiant and the stronger than expected performance of the handful of Vampires that saw action during the June Miracle, it became the fleet’s primary fighter. By now serving as flagship of the fleet Glorious’s luck was to finally run out during the Battle of the Rim. Heavily hit by gunfire from the cruiser Rinllee, her machine spaces were badly damaged and the ship lost power during her jump to Earth. Efforts to savage the ship failed and the crew were forced to scuttle the ship to prevent capture. The least known of Earth’s wartime fighter carriers but ultimately the only one to survive the Contact War, Dauntless’s wartime service largely mirrored that of her older sister, while her post war career would extend far further than expected. With the end of the conflict the fleet entered a period of refection and financial retrenchment. The loss of Glorious effectively to gunfire threw into question the whole concept of the spacefighter carrier. Experience seemed to indicate that a carrier close enough to support the gun line ran the risk of being destroyed by fire from enemy cruisers, while if kept further back, the fighters wouldn’t be able to support the cruisers in a timely manner. The arguments between the gun and fighter lobbies within the fleet meant that for twelve years following the war Dauntless remained the fleet’s only carrier. While the original laser focus reactor and engines were replaced, the first generation jump drive was not. Although this has been criticized, with her small heat sink it is doubtful whether even a second generation drive would have resulted in any meaningful improvement in mobility. This limited Dauntless’s service to within Earth’s solar system and while still listed as part of the fleet’s first line strength, by the beginning of the twenty forties she was an asset of questionable value and within the fleet was known as The Dubious. It was only with the introduction of Illustrious that Dauntless was finally reassigned as the fleets training carrier, a role more in line with her capabilities. Dauntless was briefly re-hangared to accept the Balefire fighter, the larger hangars reduced the compliment to eight. The abandonment of the Balefire as the fleet’s primary fighter resulted in the hangars for the Vampires being restored. This decision was made because of the larger number of Vampires available. Although increasingly antiquated, Dauntless has remained in service, last of the first generation starships and far in excess of her projected lifespan. This has mostly been due to fleet’s prioriting cruisers and battleships over fighter carrier. However the fleet has recently announced that due the exhaustion of spare parts for both Dauntless’s machinery and the Vampire fighters, the carrier will finally be decommissioned at the end of 2066. Her replacement will be a purpose built training ship built to commercial rather than military standards to reduce cost. Due to Dauntless’s age it is expected she will be scrapped rather than reduced to reserve. At time of writing a campaign is underway to preserve the vessel as a museum ship. Dauntless in her post war colour scheme. 1* See Ships of the Fleet Volume Two. Author’s notes: Many moons ago I designed and put up here a version of the Dauntless, a ship that readers of the Nameless War will be familiar with. At the time I was please with it but since then my abilities with Sketchup have improved and the work I did for ships of the fleet meant that the description didn’t really work any more, so time for a re-vamp. Ships of the Fleet – Aellr destroyer. 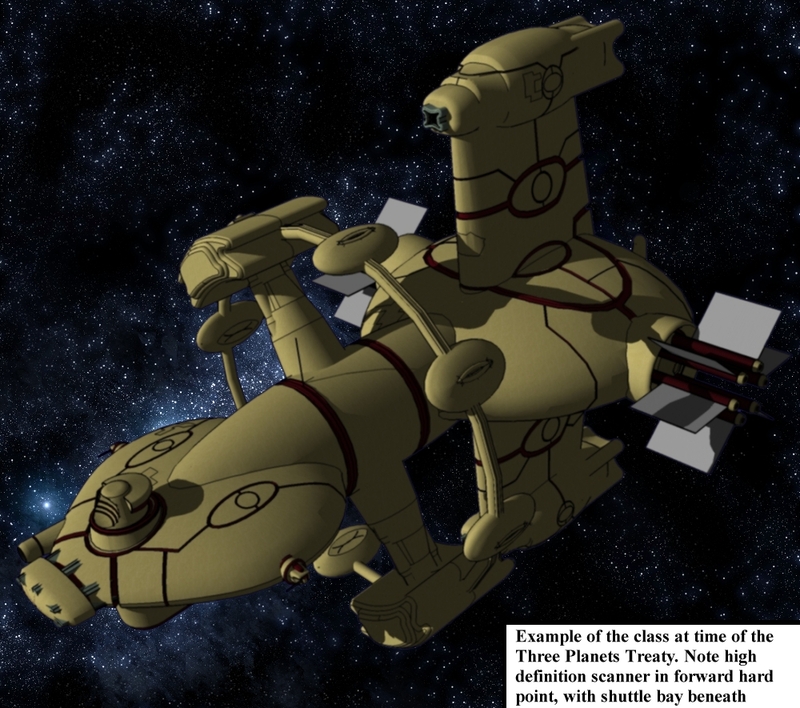 An Aellr design that pre-dates contact between the Confederacy and humanity, the Psirtas class (named after towns on the colony worlds of the Confederacy) was one of the workhorses of the Defence Fleet. The first human sighting of this design came in the calamitous days running up to the First Battle of Earth. The smallest of four ships that approached the planet, with its prominent missile launcher mounted to one side of the jump drive, Psirtas class was immediately categorised by the human defenders as a destroyer. Unfortunately this misinterpretation was one of a pattern mistakes made by both sides that would see the Confederacy and Earth blunder into the profoundly avoidable Contact War. NOTE Given the ongoing political tensions between the Confederacy and Earth background have come from secondary sources and may not be entirely accurate. The Psirtas class originate approximately fifty years before first contact; as with most Aéllr designs the class was intended to provide the Defence Fleet with a multi-role platform capable of performing search and rescue, personnel transport and internal security. As with all Aellr ‘warships’ of this period, any military role was of very much tertiary importance and little more than a fading relic of the Aéllr Reunification War of more than a century earlier. Intended to compliment the much larger Hinhle (Province) class cruisers, the Psirtas placed emphasis on acceleration over range. The design can be divided into three main segment. The forward-most section, mounted the jump drive, main bridge and the two hard points for mission specific equipment. When serving in the military or internal security role, these would mount a turret, each one carrying a single plasma cannon. Alternatives to these fittings were shuttle hangars, high definition sensor arrays or docking arm. The point defence guns – primarily intended for anti micrometeorite duties – and the probe/missile launcher were permanent fixtures. Mid ships was the centrifuge with two large pods. It is believed a small secondary bridge is housed within one pod but for the most part this space is given over to crew facilities. Several members of the class, usually when de-militarized have been observed with six secondary pods fitted to a large circular ring that connects the two primary pods. It is believed that like the forward hard points this a mission specific fitted when more living space is required. Astern is the engineering section, protruding from the ventral and dorsal surfaces of which are the engine nacelles. The length of these is to allow the engine plume to clear the centrifuge during breaking manoeuvres. The decision to extend the engine pod in the vertical axis appears to be to facilitate the class’s search and rescue role, allowing the ship to come closer along side another vessel while maintaining the same deck orientation. A side effect of this choice of orientation is that the ship’s profile in the broadside arc was considerably larger than would have been the case if the nacelles had been side mounted. This provides another clear indication how low a priority the class’s military role was. The ship’s radiator panels are housed in the broadside circular assembly which when deployed resembled paddlewheels, leading to the class’s human nickname ‘pedalo’. Physical protection was limited to anti-radiation shielding while sensors systems took the form of small clusters scattered across the main hull. Overall the Psirtas class with its emphasis on adaptability was very much a conservative design, following with standard practice of the time. The only significant break from previous practice was the absence of a raised bridge, a feature of Aéllr government ships since the Reunification War. By the time of first contact between Humanity and the Aéllr, the Psirtas class were in their middle years, with the expectation of at least another three decades of service. While an exact number constructed is not known, it is believed to be in excess of thirty, although by first contact the earliest members of the class had been withdrawn from service. When the Aéllr taskforce was dispatched to earth a single member of the class was included to act as a scout ship. The decision to include this vessel with the ships that directly approached Earth, seems to have been born of a genuine belief that the force would face no opposition. In fact the Psirtas was to prove very much a weak link. An early direct hit to the ventral nacelle rendered the ship virtually uncontrollable while the two point defence guns left a large blind spot astern. The taskforce’s attempts to support the ship meant that it neither closed on Earth nor retreated out of range between waves of human fighters. In the aftermath of Earth the casualty averse Defence Fleet appears to have come to the conclusion that the class was too fragile for front line operations. 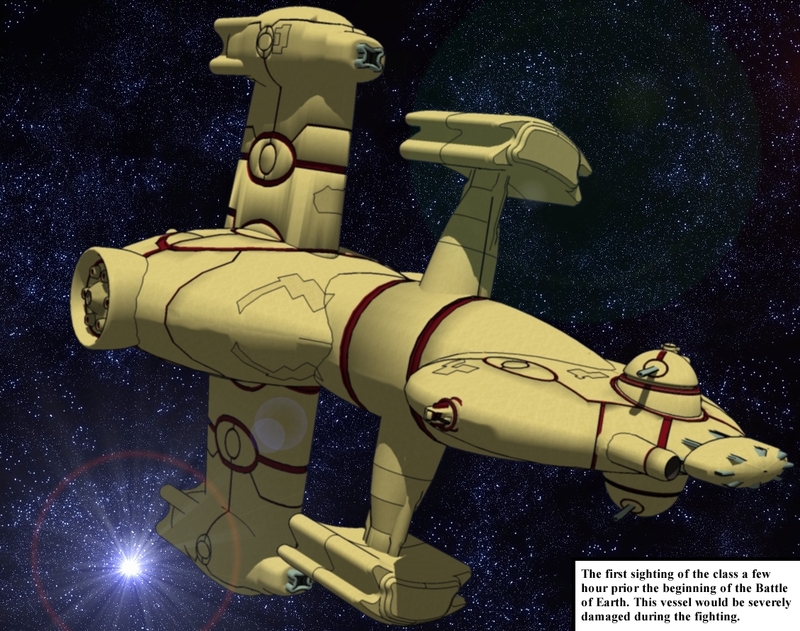 For most of the rest of the war the class remain within the Confederacy’s borders, covering for the Hinhle class ships that were being used to prosecute the war against Earth. The Psirtas would see direct combat when the cruiser Onslaught entered Confederacy space in the last year of the war, the Battle of the Three Systems being the most notable event of this campaign. Post war it would appear that the remaining members of the class were returned to their civil role. It is believed that at least a dozen remain in service with the Defence Fleet with perhaps half as many again now owned either privately or by individual colony worlds. However sources indicate that the Defence Fleet no longer rates the class as part of it’s fighting strength. 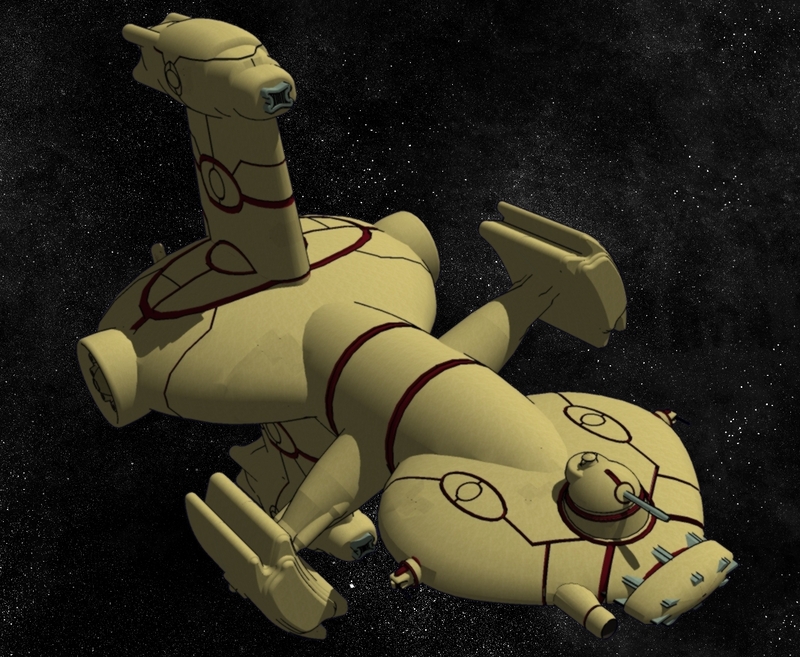 Author’s Notes: As the first alien race humanity encountered, with the war between them being the background event that did the most to shape the Battle Fleet Universe, the Aéllr are a very large part of the setting which I’ve wanted to explore for a while – especially since describing in Volume Two of Ships of the Fleet the human Contact War cruisers. Most of my ship designs are fairly brick like, in part because it is how I imagine then and in part because with the software I have access to, they’re a damn-sight easier to make. But I wanted to explore the possibilities of a design using much of the same basic technology but with a very different set of priorities at least as far as the limits of my talents and my computer processors capabilities.